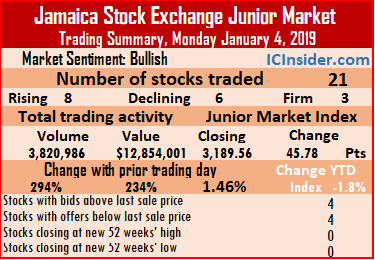 The Junior Market index of the Jamaica Stock Exchange climbed by a strong 45.78 points to closed at 3,189.56 at the end of trading on Monday as the prices of 8 securities rose, 6 declined and 7 remained unchanged. Trading ended with 21 securities changing hands on Monday, compared to 27 securities changing hands on Friday, resulting in an exchange of 3,820,986 units valued at $12,854,001, compared to 970,997 units valued at $3,844,893, on Friday. Fontana recorded the leading trade with just under 2.8 million units valued $9.8 million. Trading ended with an average of 181,952 units for an average of $612,095 in contrast to 35,963 units for an average of $142,403 on Friday. The average volume and value for the month to date, amount to 99,833 shares valued at $347,894, in contrast, the average trade in January was 2,245,428 units with a value of $7,372,574 for each security traded. IC bid-offer Indicator| At the end of trading, the Investor’s Choice bid-offer indicator reading shows 4 stocks ended with higher bids than their last selling prices and 4 closing with lower offers. 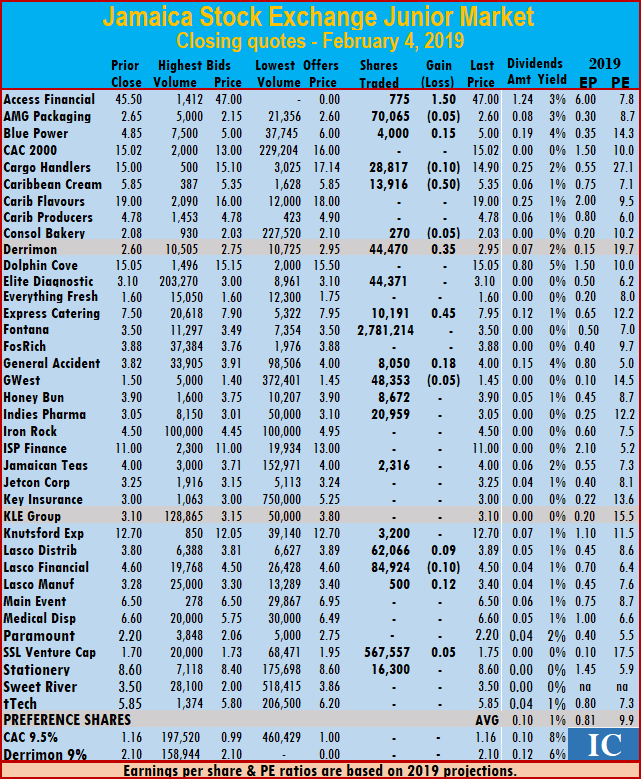 At the close of the day’s activities, Access Financial closed $1.50 higher at $47, with 775 shares changing hands, AMG Packaging ended with a loss of 5 cents at $2.60, in trading 70,065 stock units, Blue Power concluded trading of 4,000 units for a rise of 15 cents to $5. Cargo Handlers settled with a loss of 10 cents at $14.90, with an exchange of 28,817 shares, Caribbean Cream ended trading of 13,916 shares with a loss of 50 cents at $5.35, Consolidated Bakeries closed with a loss of 5 cents at $2.03, trading 270 shares, Derrimon Trading ended 35 cents higher at $2.95, with 44,470 shares changing hands. Elite Diagnostic finished exchanging 44,371 stock units at $3.10, Express Catering settled 45 cents higher at $7.95, with 10,191 units changing hands. Fontana closed trading at $3.50 with 2,781,214 shares changing hands, General Accident traded 18 cents higher at $4, with 8,050 shares changing hands, GWest Corporation finished trading 48,353 shares with a loss of 5 cents at $1.45, Honey Bun closed at $3.90, with 8,672 stock units trading, Indies Pharma closed at $3.05 trading 20,959 shares. Jamaican Teas finished trading 2,316 shares at $4. Knutsford Express finished trading 3,200 shares at $12.70, Lasco Distributors gained 9 cents to close at $3.89, trading 62,066 shares, Lasco Financial ended with a loss of 10 cents at $4.50, with 84,924 shares changing hands, Lasco Manufacturing concluded trading of 500 stock units and rose 12 cents to close at $3.40. SSL Venture Capital rose 5 cents in exchanging 567,557 shares to close at $1.75 and Stationery and Office closed at $8.60, with 16,300 shares changing hands.